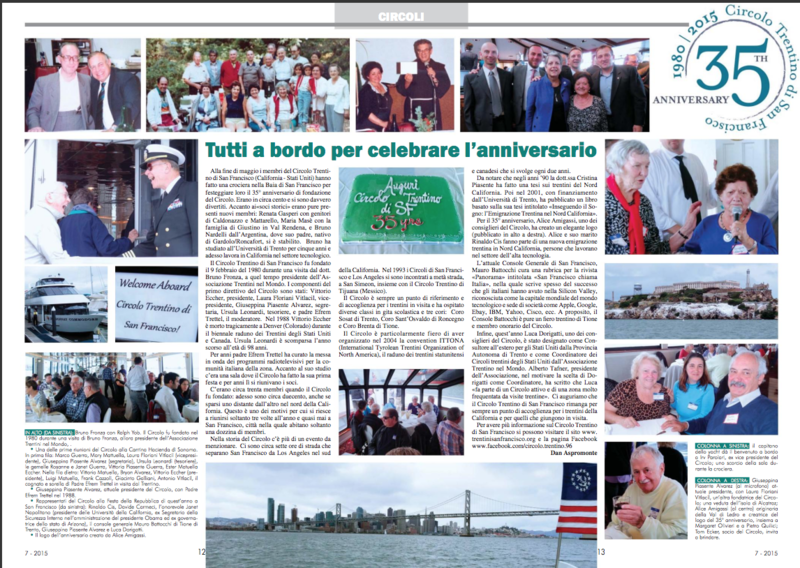 Last July our club was featured in a 2-page article in the Trentini nel Mondo magazine, which included various photos from the past and from our 35th anniversary cruise on the Bay. Click here to access the July issue, and then click forward to the article. 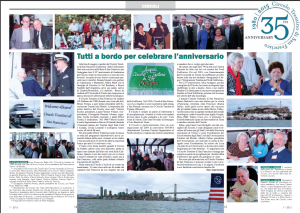 In the same issue you will also find a photo of the 19 world representatives (“coordinatori”) to the Trentini nel Mondo Association, including USA’s Luca Dorigatti. In August the descendants of sisters Erinna (Irene) and Fiorella Menghini from Brez, Val di Non, gathered for a barbecue and dinner. You’ll find their organic apples at most Bay Area open markets. Fiorella Menghini married Giovanni Battista Zuech (changed to Zueck). Their descendants, the Zuecks and Aspromontes, live in Santa Cruz and Southern California. 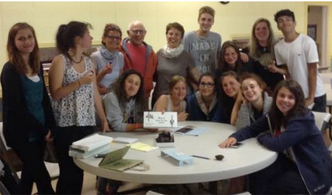 Every summer the Province of Trentino organizes a youth exchange program. Unfortunately, our club has not had a participant in the last couple of years. Emily Kalstad of the Seattle Club took advantage of this program last summer and spent time with the Schwarz family of Smarano in the Val di Non. Then, 26-year-old Giulia Schwarz spent time with the Kalstad family in Seattle. Giulia’s mother is a member of the Menapace/Pilati family from Tassullo and related to our club members Linda, Valerie, and David Pizzorno. Giulia came to California to do some sightseeing and to visit her relatives. Several members of our club hosted and assisted her: Dan Aspromonte and his son Daniel, Lino and Janet Rizzi, Michael Job and Heidi Vitlacil. Dan Aspromonte even discovered that his cousin and Giulia’s father attended high school together in Cles and were the best of friends. It’s certainly a small world! During the summer of 2012, the video documentarian Vincenzo Mancuso interviewed around 20 members of our club. Due to the constraints of time, snippets from only a handful of those interviews were used in the documentary. Included were club members Silvia Torresani Prevedelli, Gemma Angeli Zueck, Vero Oliveri, Ralph Yob, our president Giuseppina Piasente Alvarez, our treasurer Laura Floriani Vitlacil, and of course, Father Efrem Trettel. television broadcasts for the Italian community of the Bay Area. Father Efrem donated his some of that material appears in the documentary. Here it is possible to see the documentary about the SF area. Enjoy!! 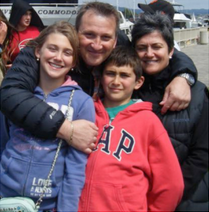 Club officer Luca Dorigatti spent few weeks vacationing in Italy this summer with his family. During a visit to the Trentini nel Mondo office, he was asked to speak about our 35th anniversary cruise on the Bay. To listen to the 5-minute interview on Radio Italia 60, click here. Luca also spoke about our club’s history, mentioning in particular the pivotal roles played by Father Efrem Trettel, our president Giuseppina, and Dr. Bruno Fronza. Luca joined the club soon after he arrived in California 24 years ago. He became good friends with Father Trettel, who officiated at his wedding and baptized his children. 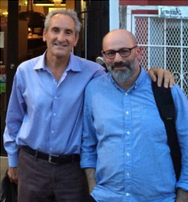 Maurizio Tomasi, editor of the Trentini nel Mondo magazine, conducted the interview. There is a special treat at the end of the interview when Luca’s daughter Eryka and son Nicolas greet the radio audience. Radio Italia 60. A link is located on the right side of the Association’s homepage: trentininelmondo.it. 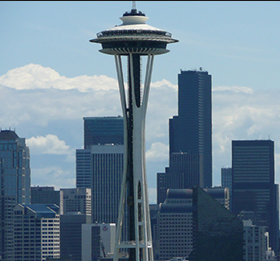 The Seattle Trentino Club is the newest of the 21 that exist in the US. It was founded less than 10 years ago, primarily by descendants from the town of Revò in the Val di Non. They are a very active group, and this summer they sent to Trentino one of the five Americans that participated in the youth exchange program. Her name is Emily Kalstad, and the family is from Dambel in the Val di Non. Next year the group hopes to host the Coro (Chorus) San Romedio of the Val di Non. Perhaps we can convince the group to come to California as well! Bob (Robert Angelo) and Ruby (Franch) Zanoni are longtime parishioners at Presentation Catholic Church in Stockton, a place they refer to as their “home away from home”. On June 12, 1954 they were the first couple to be wed at the church. In April of this year, Presentation dedicated 2 pages of their newsletter to Bob and Ruby and their history in the community. Franch and Felicita Flor, were also from Cloz. Her father was a coal miner in Illinois and Missouri, and her parents married in St. Louis. They later moved to Stockton where Ruby’s father practiced carpentry. In 1950, 19-year-old Ruby accompanied her parents on a trip to Italy. In transit they stopped in Chicago to visit Bob’s grandmother, who they knew from their time in Cloz. During the visit Bob and Ruby met and established a long distance friendship. 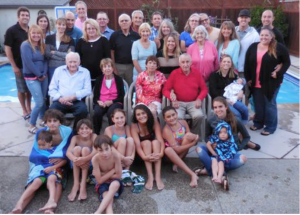 That led to a lifetime of bliss plus 6 children, 12 grandchildren and 3 great-grandchildren. grocery business but then ran a car wash till retiring. 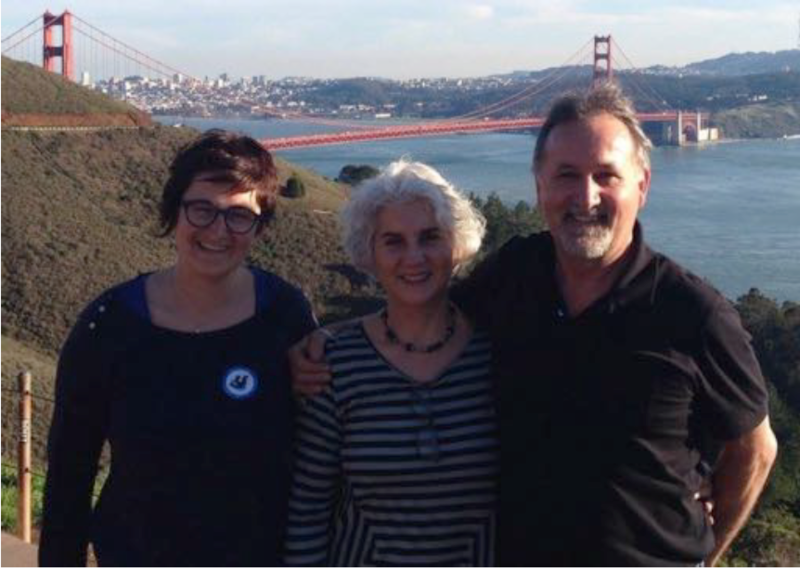 Bob and Ruby are active members of their local branch of the Italian Catholic Federation (ICF) and Bob served as president. Bob’s uncle, Father Silvio Zanoni, was instrumental in forming ICF clubs in California and Las Vegas. Bob is also our club’s representative in the Central Valley. We are not alone in thanking Bob and Ruby for their dedicated service to the community. 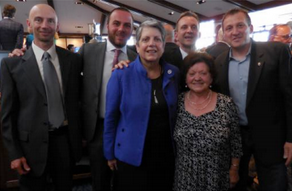 Festa della Repubblica: Rinaldo Cis, Davide Carmeci, Janet Napolitano, Consul General Mauro Battocchi, Giuseppina Piasente Alvarez, Luca Dorigatti. Club member Father Alberto Mengon was also present but left before the photo was taken. The Festa della Repubblica on June 2nd of each year celebrates the creation of the modern Italian nation. That occurred after WWII when citizens voted 12,717,923 to 10,719,284 for a republic rather than the House of Savoy monarchy. The members of the monarchy then fled in exile. Each year the consul general invites members of the Italian community to celebrate this national holiday. This year the celebration was held at the St. Francis Yacht Club, and members of our club were present. They had the honor of meeting Janet Napolitano, former Arizona Governor and Homeland Security Secretary in the Obama administration, and currently the president of the University of California system. Her father’s family is from the province of Foggia in Puglia, the heel of Italy, not from Naples, which is implied by her name. On May 17th our club celebrated its 35th anniversary with a cruise on the San Francisco Bay leaving from Alameda. Nearly 100 attendees delighted in the experience. Present were some new members, Bruno Nardelli, Renata Gasperi and Maria Masè. At the age of 5, Bruno Nardelli’s father emigrated from the Trento suburbs of Gardolo/Roncafort to Argentina. As a child, Bruno participated in the activities of the Circolo Trentino di Comodoro Rivadavia in Patagonia, the world’s southernmost Trentino club. Argentina and Brazil have more Trentini clubs than any other countries, with 57 and 60 respectively. Bruno studied at the University of Trento for 5 years while volunteering at the Trentini nel Mondo Association. He then transferred to Houston for work and now to the Bay Area. Welcome Bruno, Renata and Maria to the Circolo Trentino di San Francisco!